Robert Earl Hughes was born August 8, 1932 on a farm in Center, TX, to Theron and Thelma Hughes. One of ten children, Bob quit school after the 8th grade to help care for the family because it was a difficult time. At the age of 17 Bob joined the Air Force and was stationed at Clark Air Force Base in Manila, Philippine Islands – a decision that would change his life. Revival had come to his hometown and many were saved under the preaching of Dr. John R. Rawlings, but Bob’s salvation came as a result of the work of missionaries Frank Hooge, Elmer Gullion and Joe Vella in Manila. God burdened his heart to reach the Philippines with the Gospel, so after his discharge he entered Baptist Bible College in Springfield, MO for training. While in school he met and married Helen Johnston in 1954 and then graduated in 1955. 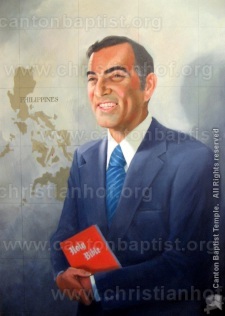 Within four years from the time he left the Philippines, Bob and Helen and a daughter, Cindy, returned as missionaries. Soon after, another daughter Karen was born. In the midst of all these ministries, Bob was diagnosed with colon cancer in 1975. He returned to the States for treatment. En route to the airport on what would turn out to be his last day in the Islands, he passed by a man on the corner reading one of the little red New Testaments. On August 21, 1976 God took him home to heaven at the age of 44. Following his death the dream of raising the funds for the million Bibles was realized.